sunday 9 believes knowledge of the technical facts is important to an understanding of the political facts. TRAPNELL Yes, I do. Now that doesn't mean that everyone has to study nuclear physics. It does mean, however, that one must have enough of a grasp of the basic technical facts to appraise the political and social implications. These are not difficult, in spite of formidable new terms, in spite of strange new terms of reference. It is sometimes hard to sink your teeth into these facts because we've had so little background for them. 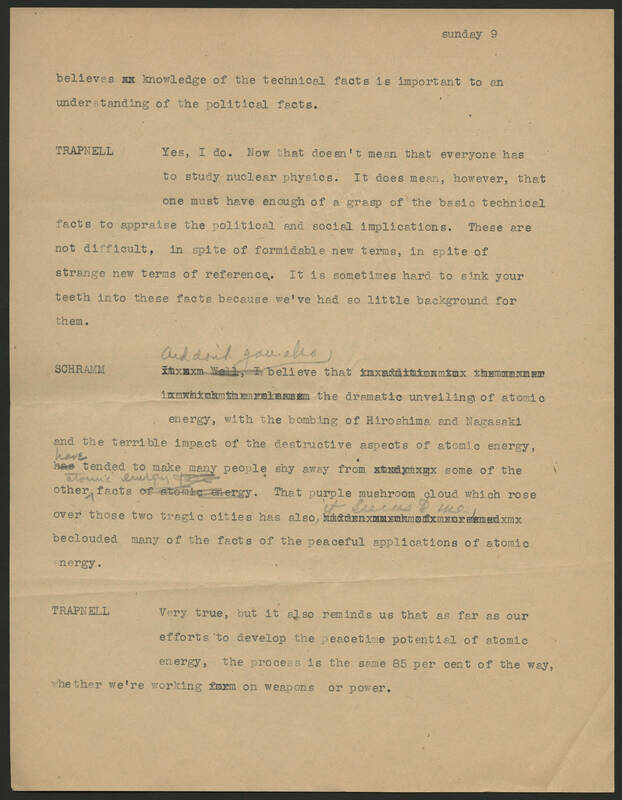 SCHRAMM And don't you also believe that the dramatic unveiling of atomic energy, with the bombing of Hiroshima and Nagasaki and the terrible impact of the destructive aspects of atomic energy, have tended to make many people shy away from some of the other atomic energy facts. That purple mushroom cloud which rose over those two tragic cities has also it seems to me, beclouded many of the facts of the peaceful applications of atomic energy. TRAPNELL Very true, but it also reminds us that as far as our efforts to develop the peacetime potential of atomic energy, the process is the same 85 per cent of the way, whether we're working on weapons or power.